Posted on February 27, 2018 at 5:21 am. It’s nearly time once again for Parent-Teacher Conferences! Conferences will be held “Arena style” this THURSDAY afternoon from 4:30 – 7:30 PM, and on FRIDAY morning from 7:30 to 11:30 AM. Tell your parents that they can meet with ONE or ALL of your classroom teachers. No appointments are necessary, but meetings are limited to 5 minutes each. Parents and teachers together — what could be better than that?! On your marks, get set, GO!! Are you ready to help the WMS Track and Field Team defend their County Championship this year? Interested athletes are invited to an informational meeting TODAY during ASP 1 in the gym. You’ll get to meet the coaches, ask questions, and learn everything you know to know about the upcoming Track and Field season — which begins on March 12th. Just sign-up using the QR code outside of the cafeteria, or see Coach Treble with any questions. The National Museum of African American History and Culture opened to RAVE REVIEWS last year — and now YOU can see it for yourself! WMS is organizing a field trip to the African American Museum on March 9th. It’s open to all students — but space is limited, so it’s first-come, first-served. Just get a permission slip from the main office and return it ASAP. See Ms. Cameron or Ms. Mays with any questions. Don’t miss out of this amazing opportunity!! The WMS Theater Department will be rehearsing the Spring Musical TODAY after school in the auditorium. But rehearsal will be CANCELLED for TOMORROW, due to parent-teacher conferences. Once again: there IS a rehearsal today, they is NOT a rehearsal on Thursday. See Mr. Brown with any questions. The 2017-2018 WMS yearbook is on sale NOW!! To get yours, just click the link on the WMS Website and complete the online order form. Yearbooks cost just 40-dollars — or for 55-dollars you can get the exclusive “Signature Package.” But orders MUST be received by this THURSDAY, so get yours before they’re gone. See Ms. Briones with any questions. The WMS Yearbook — Don’t miss out on the memories! All middle school boys are invited to the upcoming APS “Color of Leadership Conference — Find Your Superpower!” — on Saturday, March 10th from 8am to 2:30pm at the Arlington Career Center. This exclusive program includes leadership workshops, roundtable discussions, mentoring, and of course FREE FOOD!! Interested boys MUST register for the event by next FRIDAY. To sign-up or for more information, see Ms. Cameron or go to the main office. Boys rule!! It’s time to share the love, Williamsburg! Just a few days remain for the WMS Kindness Club’s “Have a Heart” campaign. Animal shelters across America house THOUSANDS of homeless pets — but often can’t provide even basic warmth and comfort. The Kindness Club will be collecting new or gently used towels and blankets for donation until the end-of-the-week. Collection bins are located in the main lobby by the library. So “have a heart” and “do your part” to support our furry friends in need! 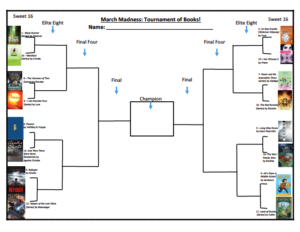 March is just on the horizon — which means it’s nearly time for the annual WMS March Madness Tournament of Books!! Next month, sixteen of the most popular books are going head-to-head — and YOU get to vote on the best-of-the-best. To get started, check out the Sweet Sixteen on the board by the cafeteria. Work with your TA to complete a bracket and make your pick for each round of the competition. Then wait for voting to open next week and see if you can win bragging rights for the March Madness Tournament of Books! Good luck wolves, and let’s get reading!